Scottoiler are continually striving for the next innovation, placing great importance on Research & Development. 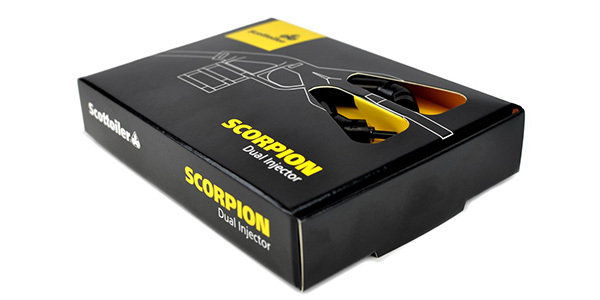 The company launched the new Dual Injector dispenser compatible with all Scottoiler chain oilers and to be known as the “Scorpion.” The Scorpion will be presented for the first time at the Motorcycle Live Show in Birmingham. The Scorpion Dual Injector is an accessory upgrade for all Scottoiler chain lubrication systems. The easy-to-fit and discreet twin feed provides enhanced oil delivery to both sides of your chain. Replacing the standard dispenser it works by feeding oil simultaneously to both faces of the sprocket through its unique twin feed pincer nozzles. 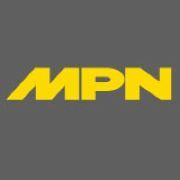 This precise application ensures an even distribution of oil onto both sides of the chain via the sprocket. The more precise application can result in an even cleaner transmission, less oil use and increased intervals between refills. The Scorpion uses Scottoiler’s new Multiform Dispenser Mount, utilizing high quality super-adhesive tape that sticks to all surfaces and provides an easy and effective solution for mounting the Scorpion. The new Multiform Dispenser Mount can be bent and cut in various ways giving the Scorpion the versatility to be fitted to nearly all swingarm types and in different orientations allowing for compatibility with a greater number of different makes and models. In addition, the new mounting bracket can be easily adjusted, re-positioning the Scorpion pincer nozzles to accommodate chain adjustments. Once fitted to the bike the Multiform Dispenser Mount has adjustability for forward and rearward movement, this means as the chain is adjusted the Scorpion can be moved the same amount so that the nozzles always sit perfectly on the sprocket. The Scorpion is supplied with small straight pincer nozzles as standard, giving a very neat and effective application. Also supplied are longer pincer nozzles that may be required for some bikes with toe guards such as the Honda Africa Twin.